German technical death metal band Obscura has revealed that they've now entered the studio to begin tracking a new album. 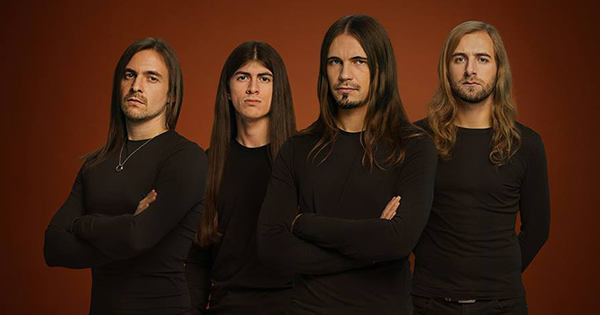 The record will be the fourth and final installment of the four-album concept that commenced with the release of the band's 2009 album, Cosmogenesis. Obscura has once again enlisted the talents of V. Santura (Triptykon, Barren Earth) for production guidance. Bassist Linus Klausenitzer comments (see full video below): "Don't worry, this is not the end of Obscura, of course, but this is the end of the four-album concept. So, you can imagine it's very heavy since it's about the end of a lifecycle... in my opinion it's the most technical album, it's the most melodic album, and Rafael [Trujillo, guitar] and Sebastian [Lanser, drums] started to bring in their song-writing ideas as well, so it's more diverse than ever. We are all super excited about the songs." More details (including in-studio videos) will be shared in the coming weeks.